This is another Kailua publication that I love receiving and reading…so it was again quit a shock and honor when they asked to do a story on the store! Of course I said YES! I love the photos they took for this spread, as well as how beautifully written it is. I am always so impressed when someone can take my ramblings and turn them into a perfectly stated expression of what I was thinking. This article really touches and captures the importance of community and collaboration with other artist. I hope you enjoy reading it! September Feature in the Midweek! I love when Tuesday comes around and the Midweek is in the mail, it’s my favorite newspaper to read. So when I opened the pages and saw the store featured on there, I was beyond excited! 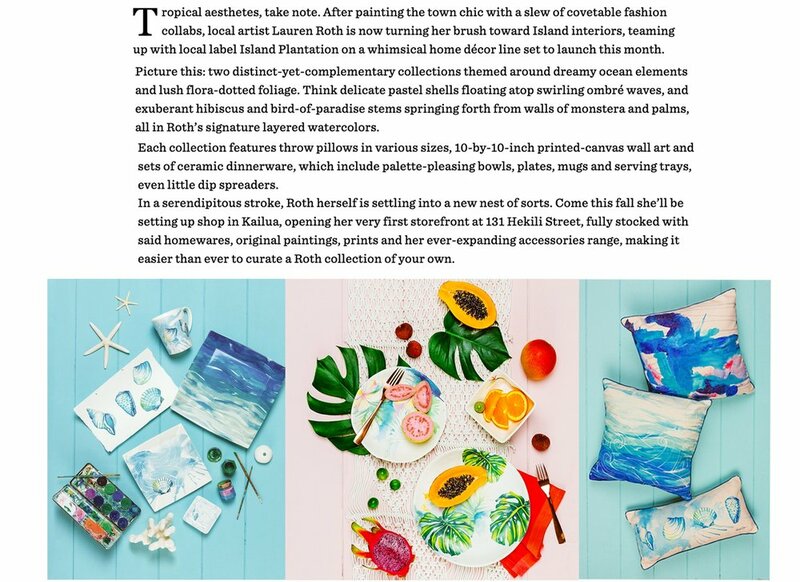 Honolulu Magazine Home Decor Debut! The opening of the store will also bring the debut of my brand new Home Decor Line! Honolulu Magazine featured the debut in their summer issue, taking the most beautiful photos of the items. The line will consist of Pillows, Dinner Set Plate, Platters, Dip and Spreaders and Coffee Mugs. The line will drop at the store opening, just in time for the Holidays!